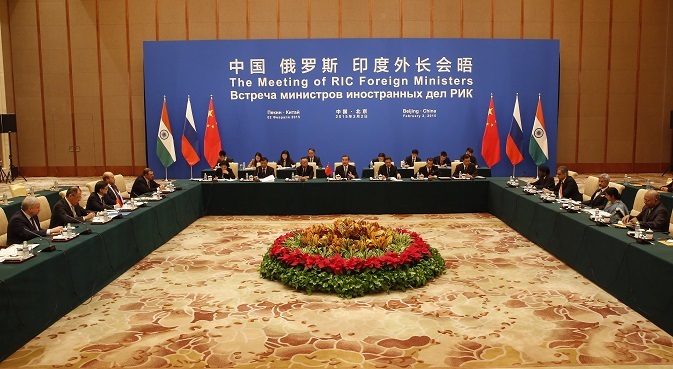 The recent meeting of the foreign ministers of Russia, India and China (RIC) in Beijing has imparted a fresh momentum to expanding trilateral cooperation in the Eurasia region. The decision by Russia and China to endorse India’s inclusion in the SCO will spur this process of regional integration, says Boris Volkhonsky. The meeting which took place in Beijing in February between the heads of foreign ministers of Russia, India and China (RIC) cannot be called a summit in the full sense of the word. However, the decisions that were reached there, in terms of significance, outweigh the decisions of many summits. In essence, the ministers agreed on a plan to create a new, integrated system for the region, covering a large part of Eurasia, thereby defining the system architecture for global politics and security. The idea itself of developing a three-way pivot between Moscow, Beijing and Delhi was put forward at the end of the 90s by Russia’s then prime minister Yevgeny Primakov. For many years it was discussed as a purely intellectual and theoretical construct. There were many reasons for this: the problems in relations between the two “points” of the triangle – China and India, and purely geographical factors, hindering the creation of common infrastructure. But the main issue was the lack of any real mechanisms for integration which would enable discussion about a general economic basis for such a union. But following the formation of BRICS, the notion of RIC was included in this broader format and appeared to have lost its relevance. In fact, India’s geographic isolation (adding to political factors linked with the situation in Afghanistan and Pakistan) from the rest of Eurasia has remained. The problems with Sino-Indian relations have not been fully resolved. In addition, within the framework of the RIC trilateral format there are no significant economic cooperation mechanisms. Bilateral cooperation between each pair of members of the RIC countries is developing successfully, but major trilateral projects are still out of the question. Today, however, cooperation in the RIC format is taking on a new relevance and meaning. The reasons for this are global in nature. In this regard 2014 was pivotal for the fate of global politics. I note only four factors. 1. According to the IMF, China ranks first in the world in terms of the economy, measured at purchasing power parity, dislodging the US out of this position, and thus, dealing a severe blow to the US monopoly as the sole global economic leader. 2. In July, at the BRICS summit in Fortaleza (Brazil), countries in this group made the final decision to establish the Development Bank in the future – a real competitor to the world's reigning financial institutions. The Bank marks a departure from the past Bretton Woods system. The decision on the BRICS bank was later supplemented by a number of bilateral agreements on the transition in the calculations between the member countries of the BRICS national currencies. Thus, the dollar is faced with the prospect of losing its monopoly as the world's sole reserve currency. 3. In September the Shanghai Cooperation Organization (SCO) summit in Dushanbe adopted a “roadmap” for further expansion of the organisation, and the first candidates for membership listed India and Pakistan. The SCO is becoming the world's largest integration association – in terms of both the populations of its member countries, as well as for the total trading volume. 4. Finally, in 2014 the principles for the transformation of the Customs Union of Russia, Belarus and Kazakhstan in the Eurasian Economic Union (EEU) were finalised, which began working from January 1,2015. It has been joined by Armenia, and Kyrgyzstan is expected to join in the near future. To date, 40 countries have stated their desire to create a free trade zone with the EEU. One of these countries became India. It is hardly coincidental that the crisis in Ukraine erupted just at the time when the BRICS countries announced the establishment of the Development Bank; and the European Union and Russia were coming close to creating a model of integration in the energy sector. On the other hand, the negotiations on the establishment of transatlantic trade and investment partnership had ground to a halt because of the reluctance of Western Europe to turn into a partial colony of the USA. Russia’s foreign policy’s U-turn towards the east can be partially considered a reaction to events taking place at the western borders of Russia. But in fact, it was being prepared for a long time and reflects both Russia's desire to develop relations with its neighbours in Asia, and the objective necessity of a real center of power, capable of withstanding a unipolar world order. And in this respect, the interests of the three great Asian countries are the same, and that is reflected in the outcomes of the meeting of the foreign ministers of the three countries in Beijing. They emphasised the desire to further develop cooperation within the BRICS. The consistent desire of Russia and China to see India as a full member of the SCO was also noted. In this way, integration was intensified in the past year and the coming year will give a new boost to this process. To a large extent, this will help overcome obstacles to trilateral cooperation. By connecting India to the SCO, it will be possible to create a real format for multilateral cooperation for the reconstruction of Afghanistan and the development of natural resources in Central Asia. It will also enable various joint infrastructural projects, where the three countries are still considered as competitors, especially the Chinese New Silk Road and the North South international transport corridor which Russia and India have been developing for a long long time with the participation of other countries. Finally, the expansion of the trilateral cooperation format will allow India to take a more active part in the affairs of the Asia-Pacific and in fact “legitimize” the concept of the Indo-Pacific super region – a concept that has yet to take root in political science discourse.